Today is Thiruvonam.. my kitchen lingers with the smell of payasam.. it’s just 8am and I am already waiting for my kids to come back from school and relish their favorite paal payasam with boli. As I sit at my dining table looking out through my kitchen window, my memories linger on the onam I have celebrated in the past. 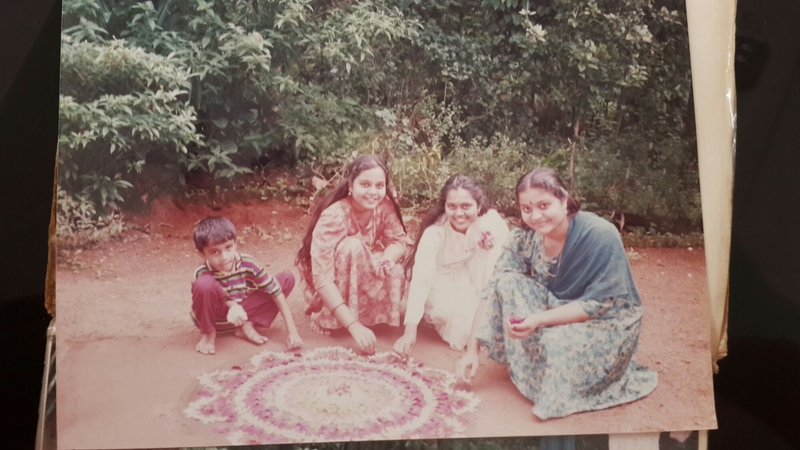 The very first onam I celebrated was when I was sixteen years old. 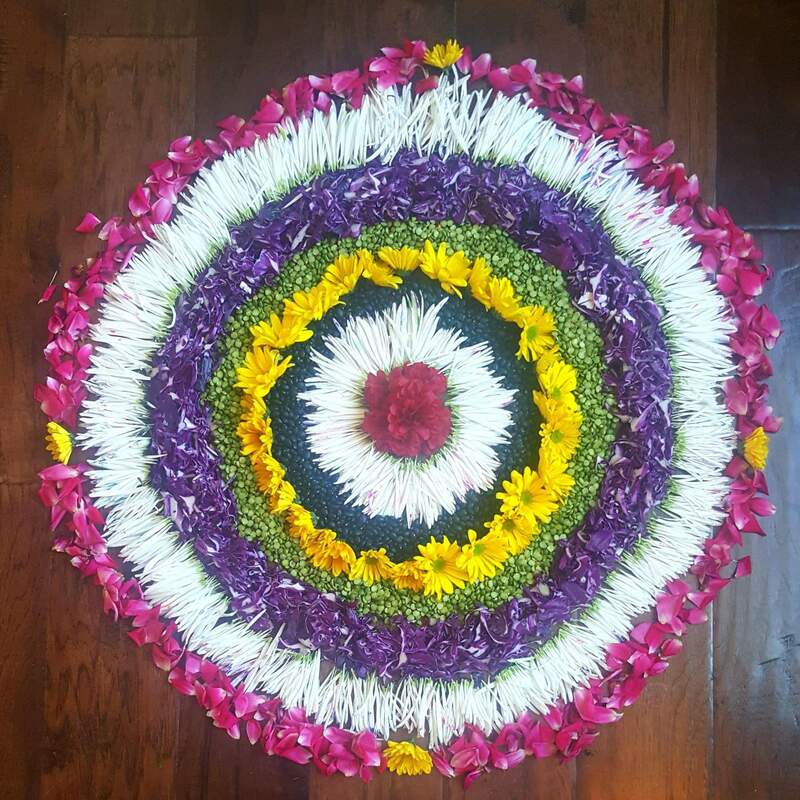 My family lived in Bangalore and I am not quite sure why my mother never celebrated onam. Too late to ask her now, anyways. Our visits to kerala was during the school summer vacation and most of the time we made it for Vishu (April), but not Onam (August/September). So once I finished my 10th grade, I moved to college and this time I went to Kerala during Onam. It was the first and best onam of my life. My cousins and I plucked flowers and put the pookalam. We made onathappan with clay. I had just bought a camera, we clicked pictures with everyone. My aunt spread out a Sadya for us and in the evening we went to our other aunts and uncles houses to relish the payasam made in their house. It was such an innocent phase of life. Everything was simple, I just had to look good, eat well, talk a lot and have fun. The second or last onam I celebrated was in 2013 at Trivandrum. It had been my dream to cook and serve a Sadya for my parents. That dream came true. My parents were with me. My family put out an elaborate pookalam. We cooked the sadya and my children whole heartedly enjoyed the festivities. Sadly, it was my last onam with my mother. Then there is today. My first onam in my new house. It was around 11am, everyone dressed in traditional attire, new clothes I had bought from India. Curries for the sadya were at their last boiling race on the stove. Loud malayalam music related to onam from the Bose speakers. Friends who are like family hustling in the kitchen, grabbing ladles, arranging, cleaning up. Children running around unaware of the tension in the kitchen. A true extended family household on onam. My dream. Amidst the noise my heart paused a minute and just absorbed all the din around me to preserve and lock up in my box of memories. The best onam of my life !